Stainless steel multifunction double oven is rated 4.2 out of 5 by 15. 596W x 572D x 1081H(mm) ? Anti-spatter grill inserts provide a safer and more convenient way to grill ensuring cooking fats drain away from food for healthier cooking. Rated 5 out of 5 by Ed46 from A simply wonderful appliance I replaced my 34 year old Westinghouse 600 with a WVE636 and my new oven has far exceeded my expectations. 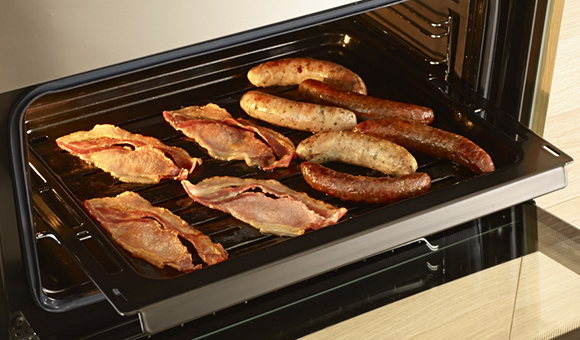 To have two fan forced ovens with two grills, simply sensational. Cakes are evenly baked and the pizza function an added bonus. So happy with my purchase. Rated 5 out of 5 by Maree1981 from Bought 2 months ago. 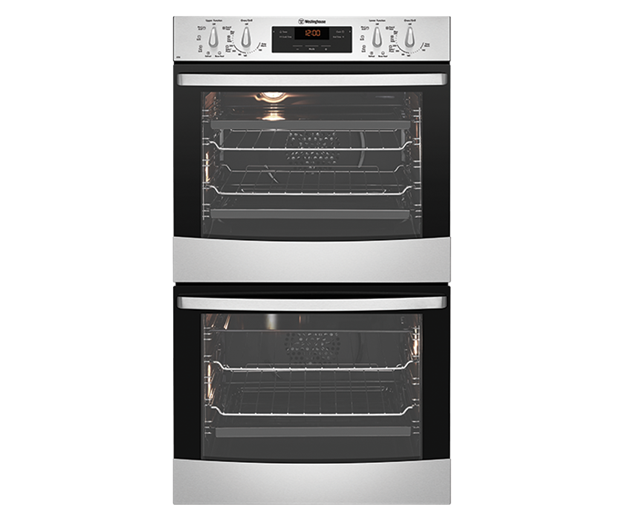 A fantastic oven, with a large family it's great being to double the output. Pizza anyone? ;-) I love the multiple functions, and the grill in both ovens (sticky ribs!). Accessories are generous. Rated 5 out of 5 by Bumble Bee from ":Simply the Best" as Tina Turner would say My wife & I had to replace our decades plus old wall oven & because of the brick wall surround, we searched for a similar size oven. To no avail. The old oven was a monstrousity. We happened upon the Westinghouse double oven, whose dimensions were close. Initially we had reservations because we never used a Westinghouse appliance before, but our fears were unfounded. Brilliant to cook with, big capacity, easy to use. To sum up, it was like going from a VW to a Lamborghini. Thank you Westinghouse. Rated 5 out of 5 by SteveVB from Excellent double wall oven I bought this double wall oven for a large holiday house that is used by our extended family. The identical twin ovens, each with a fan and grill, provide plenty of capacity for parties and for cooking different types of dish at the same time. 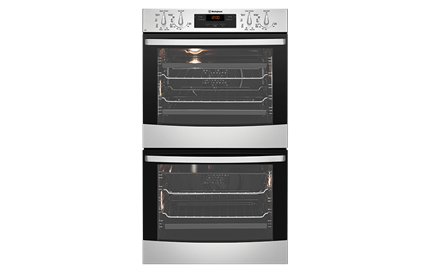 An excellent feature is the very clear control panel at the top, with 2 knobs for each oven, one to select one of the seven element/fan combinations, the other to set the temperature. Each mode is clearly marked with both a description in English and a small diagram to illustrate the elements and fan combination thereby activated. The controls are so intuitive that no one has so far found any need to refer to the instruction manuals. 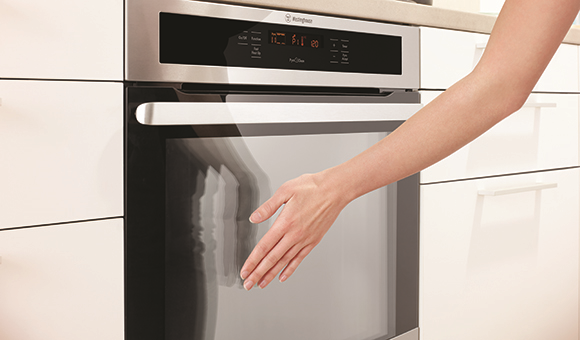 Full-width glass doors and 3 light bulbs in each oven give an excellent view of food as it is cooked. Triple glazing means that the exterior remains cool to the touch even when using higher temperatures. I have used surface rather than a flush mounting of the oven so that cooling air circulation behind the front glass panel is improved. I have ordered telescopic rack runners which are an accessory on this model but they are currently out of stock. This user-friendly oven has earned immediate approval from everyone who has tried it so far, especially ease of use with the clear control panel. 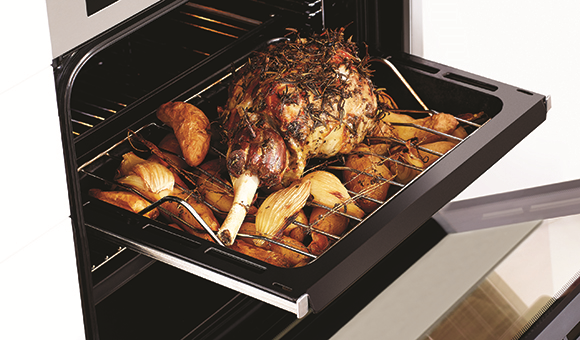 Rated 5 out of 5 by Andy 2125 from Great features in a double wall oven. Needed a double wall oven to replace a broken old one and this oven fitted the existing space. A bonus is the fact that it has two full sized identical ovens each with a grill and both are fan-forced. Copes with all the cooking I love to do. Thank goodness Westinghouse manufactures such an oven as affordable double wall ovens are not easy to find! Rated 5 out of 5 by Terri15 from Best Oven I bought my Westinghouse WVE636S oven recently. 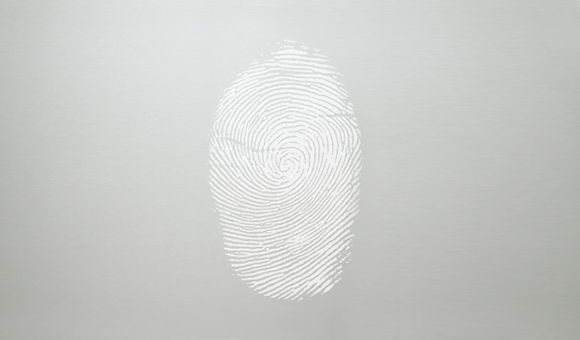 It works fantastic and it has very sleek modern look. So far I am very happy!! !